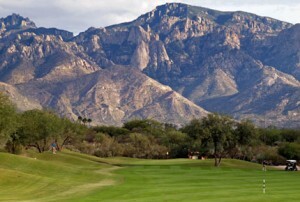 The Views Golf Club is located in Sun City Oro Valley. Sun City Oro Valley is a Tucson Retirement Community located in Oro Valley AZ. Sun City Oro Valley is a Del Webb Retirement Community in Northwest Tucson. In Sun City the term “active adult” can’t be over stated. The Views Golf Club has been built though the community of Sun City Vistoso. The course stretches out over the gently rolling desert landscape and provides fantastic views of the Catalina Mountains and Pusch Ridge. The Views Golf Club in Sun City Vistoso is a desert-style course. It has a traditional feel due to the lush fairways, trees and water hazards. While the course is fairly forgiving, errant tee shot will be a double boggie. Wildlife abound with Bobcats, Javalina, Rabbits and Deer found watching the golfers on “their” turf. If you are a avid golfer looking to retire in a peaceful desert setting, Sun City Vistoso and The Views Golf Club just may be your dream come true. The Views Golf Club is easy to get to from any where in Oro Valley and Northwest Tucson. Follow Rancho Vistoso Boulevard off Oracle North of Oro Valley. Alternatively, Take Rancho Vistoso Boulevard off Tangerine and go North. The Sun City Oro Valley Community center is on the North side of Rancho Vistoso. Follow the signs to the Golf Course parking area. Two other Tucson Golf Retirement Communities that should be considered are Saddlebrooke, Saddlebrooke Ranch and Heritage Highlands. Saddlebrooke has 3 golf course and Heritage Highland 1. These are also active adult communities with beautiful golf courses and many other things to do. Thinking about retiring in Tucson Arizona OR considering luxury La Paloma homes? We can help! Questions about Tucson Homes, Tucson Real Estate Market or Sun City Vistoso Homes for Sale & the Views Golf Club? Call Us 866 316 5575 OR complete the CONTACT FORM and we will get right back to you!